Thanks for visiting the Pomeranian Club of Central Virginia’s blog. Please take a moment to comment below and let us know where your from, what brought you to our page, what you think about Poms, or to just say “Hi”! Being a small club, we don’t get a lot of web traffic which keeps us from appearing at the top in search engines (Google, Yahoo, etc.). The more activity and comments we have helps us rise in the rankings making us easier to find. Any profane, solicitation, or otherwise offensive comments will be deleted. I have an abandoned pom that I cannot keep. Are you accepting dogs or can you recommend an organization that is? My name is Dianne Bradley and I am the organizer of Pomeranians on Parade. We will be marching in the Montgomery County Maryland Thanksgiving parade this Saturday 11/21/15. You are more than welcome to join us if you have Poms that are friendly. Perhaps this will help them get more exposure. We are a social group but also foster and do what we can to help Poms in DC, Maryland, and Virginia. I did not know that your group existed. The parade will be televised live and broadcast several times on TV on Thanksgiving day. If you want to participate let me know. Also, I don't mind listing you on our website. 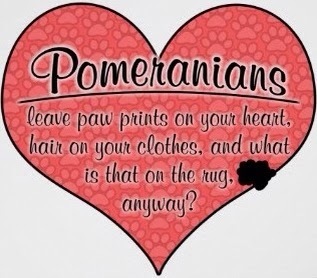 I've been in love with the breed for 29 years and have been “mom” to 5 very precious Poms throughout those years. I found your website through the FB page of Christine, Dee Little Poms. I love groups which are actively involved in rescuing and finding homes for unwanted Poms. I am in Richmond and function as a moderator of this site. Myself and fellow members of the Pomeranian Club of Central Virginia are happy to answer any questions you may have about Poms.